May is one of the most magical months in the Niagara Falls region, and it isn’t just because thousands of visitors are starting to once again throng to the place for holidays and vacations. The warming air, the lengthening days, the arrival of the first season’s fruits, the seemingly never-ending blossoms that line roadways, parks, and ditches — there’s so much to love about May that it’s hard even for locals to keep track of it all. In many ways, however, the flowers alone are reason to celebrate the return of spring. All over the Niagara Peninsula, the few, startling colors that first appeared in April with daffodils, tulips, and new leaves become a wide and varied palette, as all types of flowers bloom, delighting the eye and the nose. If you’re planning a trip to Niagara during the month of May, be sure to set aside some time to marvel at the stunning array of floral beauty. Here are a few spots you need to be sure to check out. 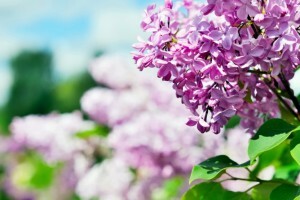 The Centennial Lilac Garden was made in 1967 as a commemoration and celebration of Canada’s centennial year, and when you step into it, it certainly seems like one of the most aromatic and colorful places on earth. During the months of May and June, the garden is at its most lovely thanks to its 10 acres of flowering lilacs and other plants that set out to bloom then. Located to the north of the Floral Clock, the garden is home to over 1,200 plants that comprise more than 200 varieties, and the luscious colors and scents are among the most concentrated in the area. Photographed almost as much as the falls themselves, the Floral Clock is a masterpiece of horticulture and clock design. 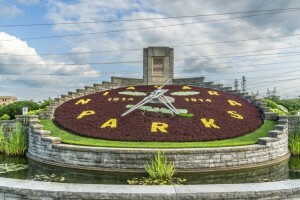 A real and working giant timepiece, the face of the clock includes intricate designs that are made of up to 19,000 different springtime flowers and plants. Changed twice a year, the springtime’s floral design features viola. The grounds around the clock are also lovingly maintained, and a visit to the tower at the back of the clock will let you see the clock mechanisms at work, as well as photographs that show the many changing faces and design the Floral Clock has enjoyed since 1950. One of the most gorgeous and peaceful spots to visit any time of year, the Niagara Parks Botanical Gardens were first established in 1936. A 40-hectare space, the botanical gardens feature everything from perennials, herbs, vegetables, and rhododendrons to shade trees, azaleas, a formal parterre garden, and a world-renowned rose garden that boasts almost 2,500 roses. The Butterfly Conservatory is also on-site, and the gardens themselves serve as the primary classroom to students who are learning the art and skills of horticulture at the Niagara Parks School of Horticulture. During May, the flowering trees and bushes make the garden feel almost ethereal thanks to the breadth and depth of scent and color. Spend some time in Niagara this spring. For lovers of color, scent, and an abundance of flowers, the region is one of the finest destinations you can visit.